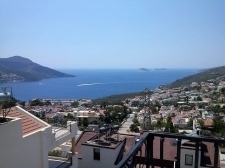 Stunning Apartments for Sale in Kalkan walking distance to Town Centre and historic harbour of Kalkan. Call Place Overseas + 44 (0) 20 8371 0059 to book your Kalkan apartment inspection trip now. Kalkan apartments are as sophisticated and understated as its residents. There are some beautiful contemporary examples around, a good 90% of them command stunning views out over Kalkan Harbour, Kalamar Bay and over the Mediterranean Sea beyond. Design is sleek, modern and unobtrusive, with open plan living spaces and large sunny bedrooms. Large windows allow residents to make the most of the views and the sunshine. Architects take pains to ensure that privacy is maintained. Apartments have large terraces and outdoor dining areas, and some even have private pools. Strict building regulations in the area ensure your sea view will remain unobstructed. Prices vary but bear in mind that the further you travel from the sea front, the less expensive apartments in Kalkan for sale become. The downside of buying an apartment further up the hill is that you will face a stiff uphill walk from the harbour. 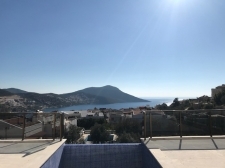 Prices for Kalkan apartments start at around £65,000, but be aware that apartments priced this low will be perched atop a hill, and generally resale properties. 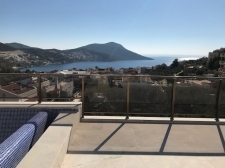 If you want to be near the harbour, Kalkan’s famous beach clubs and the town centre, you will need to spend upwards of £120,000 for 2 bedroom apartments for sale in Kalkan with open sea views.